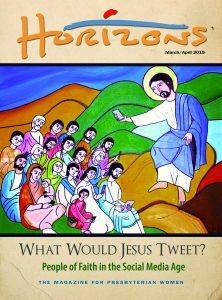 Editor’s Note: The following item is reprinted from Lakeside Presbyterian Church’s newsletter (Richmond, Virginia). 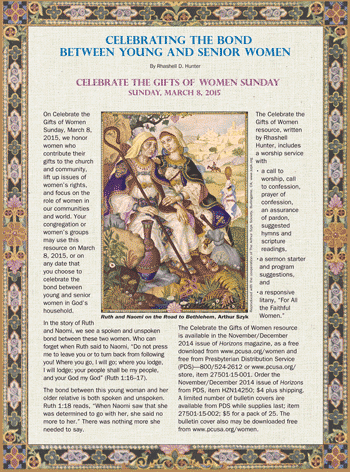 It tells how this congregation planned to “celebrate the gifts of women” on that special Sunday in 2015. The item was submitted by Jayne Sneed, former chair of the Leadership Enhancement Committee, Churchwide Coordinating Team (2012–2015). On Celebrate the Gifts of Women Sunday, we celebrate women in the household of God who regularly engage in faithful acts of service in communities of faith, hope, love and witness. 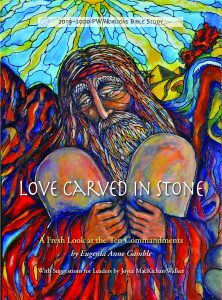 There are women in Scripture and women in our congregations who are remarkable saints in the faith. You know some of these women. If I ask you to think of someone, more than one woman may come to mind. There are also women who quietly serve the church. We do not know the many acts of service they perform. Some give quietly, without fanfare, and we may not even know their names. One difficulty in many of the passages that feature women in the Bible is that, while we may remember the woman’s gift of ministry, we do not know her name. On Celebrate the Gifts of Women Sunday, we are given an opportunity to name and remember our sisters, our mothers, our grandmothers and other women in the faith, and the many gifts that they have given. As a testament to this, we are encouraging women of the congregation to invite their daughters, daughters-in-law, sisters, mothers or any other women who are gifts in our lives. It is a way to honor them and give thanks to God! Jesus said of one such woman, “Truly I tell you, wherever the good news is proclaimed in the whole world, what she has done will be told in remembrance of her” (Mark 14:9). As a part of the Celebration of Women at Lakeside Presbyterian Church, we will hold a covered dish brunch in the Fellowship Hall, immediately following the church service. We will be honoring new life members of Presbyterian Women, as well as strengthening the bonds within our Christian family. Please plan to attend.